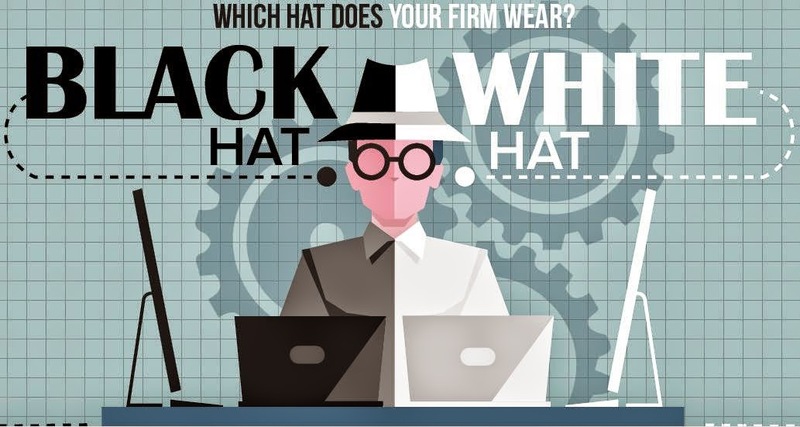 Black Hat vs. White Hat: Do You Know the Difference? Let’s face the truth: SEO is complicated. Many SEO vendors tout services similar to “Get Rich Quick! !” schemes – promising impressive results in just a month and guaranteeing top rankings. The problem with many of these fast-result promises is that they are usually rooted in black hat SEO tactics. Black Hat SEO is a “quick-fix method” generally marked by ignoring or going against search engine guidelines. Although these tactics may produce a positive return in the short-run, there is a large amount of risk associated in the long-run. Namely, that your website will precipitously drop in rankings or, even worse, be de-indexed by Google and not appear in search engines at all. Google’s Matt Cutts recently addressed these “snake oil salesmen… promising to instantly rocket you to number one.” Entire books have been written on black hat SEO, and there is a wide variety of ever-changing techniques that are used, but the following are staples of black hat SEO. Some of these marks are harder to discover than others, but if you think your SEO provider may have performed black hat techniques there are ways to uncover possible problems on your site. These pages have no other purpose than to list links, usually unrelated, which are now seen as unfavorable links by search engines. Example: When looking at your backlink profile, be on the watch for these sites that add no value to your rankings and can actually send negative signals to search engines. If you saw this on a site linking to you, it would be a link farm. Your rankings will definitely suffer if you have many links of this type affiliated with your website. Normally these sites are not relevant and your listing there is considered to be clearly manipulative. Many of these types of sites end up being penalized at some point and can be a burden on site rankings, or cause unnatural link warnings. Using an unacceptable ratio of keywords to content. If you’ve ever seen lists of keywords in an article paragraph or footer, that’s keyword stuffing. Automated spam with links to your site targeted as comments on any and all blogs. Example: If you have a blog, you’ve no doubt gotten these bogus comments promoting UGG boots or pharmaceuticals. Unfortunately, many SEO agencies do the same thing for their client sites – posting their spam on unsuspecting blogs. Purchasing links from a website that doesn’t apply to your firm’s practice area, solely to boost your rankings. Some paid links are harder to pick out, especially if care was taken in selecting the site from which to purchase the link. Reaching out to some site owners with a request for a paid link can get you reported to Google if the webmaster is offended by the request. Showing one version of your site to search engines and another to your visitors. This tactic is not used as frequently as it used to be since Google can easily diagnose it. If your SEO vendor uses outdated practices, or if your SEO is stale, you might have instances of cloaking on your site. Example: In order to diagnose this practice, use the URL http://webcache.googleusercontent.com/search?strip=1&q=cache:http://www.seomoz.com/ (seen here with seomoz.com as an example) to look at your page from Google’s perspective. The “strip” parameter in the URL removes page styling. If you see a ton of optimized keywords in this view that are not in the normal view of your site, it would indicate cloaking. Pages with lists of keywords that are designed for search engines, not users. When a user tries to access doorway or gateway pages, the page will re-direct to a different page designed for users. An example of a gateway page for a family law attorney: The gateway page is covered with lists of keywords such as “family law lawyer” and “divorce attorney” used multiple times. When someone clicks on a link to the page in search engine results, it redirects them to a different page with content on the family law practice. These are just a few black hat methods. But if even a small number of bad SEO tactics are implemented on your site, you will be affected – especially as new algorithm updates come out. To the untrained eye it can be very difficult to spot the use of some of these techniques, which is why at Consultwebs.com, Inc., we offer a free website audit to those who cannot invest the time and resources to research their own site. One of the best ways to spot black hat SEO is to know white hat SEO and its distinctive characteristics. White hat SEO plays by the rules and focuses on producing long-term results for your Web properties. While additional lead generating strategies like Pay-Per-Click advertising (PPC) are acceptable and encouraged, those are usually supplemental to other work being done. Even in white hat SEO, though, there is some risk involved. It usually takes time to see the positive results of these SEO strategies—sometimes over a year for sites when starting from scratch. It is impossible to have one-size-fits-all SEO. It’s more of an art than a science in this aspect. Although each campaign has different needs and therefore requires different methods, there are some foundational white hat SEO practices. Offering informative, useful and interesting content that prompts others to link to your page. Example: Many law firms use quick-fact pages or infographics to increase interest in their website and gain links from other websites. Even relationships and community involvement can be utilized to gain links. The more strong content you have, the better off your site will be, as that is the main thing search engines and, most importantly, your visitors seek to find. Example: A website should show continuity to a searcher—thesearch result they click on should be directly related to the page’s content. If someone searches for “cerebral palsy causes” and clicks through to your website, it should have relevant answers to their questions. For that reason, it is important to use titles and headings within your content that will direct the reader to the answers and information they are looking for. Writing a post for other peoples’ blogs, as well as posting relevant comments on outside blogs. Example: There are blogs on every subject, and usually there are respected blogs that welcome guest posts. You can build relationships with these companies and individuals so that your articles can be posted to their site, gaining recognition and strong links back to your own website. Enabling search engines to see your whole site by properly guiding users through pages via links to more relevant content. Example: Having easy-to-follow navigation throughout your site and a clear sitemap will improve your site’s usability which usually increases the amount of time people spend on the site. Site structure, meta tags, Schema.org markup, and a good information architecture are all critical to achieve high rankings for competitive search terms. For optimal usability, all pages on the site should be accessible in three clicks, with main category theme pages supported by value-added, auxiliary sub-pages. Example: Although some of these are more difficult to check, you can look into the content on your site to see how it is structured. Are the main category ranking pages as close to the home page in the URL as possible (ie. lawfirm.com/personal-injury-lawyer)? These pages should be accessible in one click from the homepage. Semantic markup and Schema.org markup help Google understand the structure of the site and the type of information being displayed. A few examples of Schema are schema.org/attorney – business address, schema.org/review – a client review on the site and schema.org/Article -structured markup for blog articles. SEO is constantly changing but there is increasing, unwavering emphasis on localization. Localization is especially important for law firms; most of the time a potential client wants to hire a lawyer that is nearby. Example: The firm name, address and phone should be on every page of the site. Also, use your firm’s full name exclusively throughout the site and avoid alternates (ie. The Johnson Law Firm, not Johnson Law, The Johnson Firm). Also, the firm name should be in the title tag on the page that Google+ Local is linked to. For one location, this would be the home page (ie. Denver Personal Injury Lawyer | The Law Firm Name). Anchor text (link text) should be mapped to particular pages and the same anchor text should never be used to link to multiple pages. Links send relevancy information to Google about which pages should be returned for certain queries. If you have the same (or similar) terms pointing to multiple pages, then Google doesn’t know which page to rank for that term, and may not rank any of the pages. Example: car accidents should always link to the car accidents page throughout the site – it should never link to other pages. Also variations of this such as car accident lawyer, auto accident and car crashes should always link to the same page. Create pages for users and not search engines. Google manipulates the search results to try out new pages at different positions. If your page’s ranking goes up and users click on the page but immediately leave, this is an indication that your page does not belong in the position. If it moves up and people find what they are looking for and do not go back to the search page, then this is an indication that Google should promote this page more because it is answering the needs of the searcher for their particular query. Example: Bounce rates for your site are tracked and easily accessible in Google Analytics, and are helpful to check as you improve your site’s usability. To make the page more interesting to the reader, add videos, graphics, statistics, etc. Do not try to squeeze as many keywords in as possible because the page will be hard to understand and visitors are more likely to leave quickly. Before using keywords in your site content, their effectiveness should be analyzed. Example: There can be a huge difference even between close terms like ‘attorney’ and ‘lawyer’. ‘Attorney’ has an estimated 11,100,000 local monthly searches, while ‘lawyer’ has 6,120,000. Also, the best keywords depend on the type of visitors your firm is seeking – ‘lawyer’ is normally better for injury related terms (car accident lawyer, brain injury lawyer) while ‘attorney’ is normally better for business related terms like bankruptcy attorney. It is important to note that Google changes its algorithm frequently (often due to abuse by spammers). Sometimes site rankings are negatively affected by these algorithm changes. The effects can be more detrimental if your SEO is out of date. In general, if you follow Google’s advice and focus on users instead of search engines, you’ll have a good chance of survival when updates roll out. Black Hat vs. White Hat SEO: Which One Was Used on Your Site? The risks of black hat SEO are heavy; it isn’t worth the quick rankings to deal with potentially long-term damage. Worst of all, your site can actually be de-indexed which means search engines refuse to put your site on any results pages. Stay on the right side of the line, and you’ll avoid these damages.